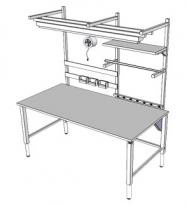 This versatile workbench is ergonomically designed for the industrial athlete to create a comfortable and productive environment for all workers. 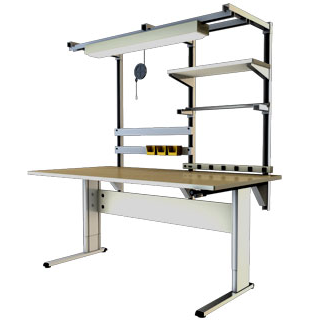 The workbenches adjust in height from sit-to-stand positions to accommodate the diverse needs of today’s workforce. With infinite height settings each user can work in optimal postures whether using a chair or a production stool. 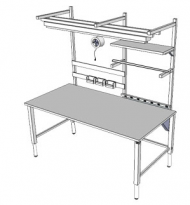 The flexible and modular design of the tool rack places tools and equipment within easy-reach to improve productivity and performance. We will match any compedative writen desk/table quote in Canada/USA from an authorized reseller - shipping charges vary depending upon a number of external factors. NOTE - Shipping and related fees will be changed sperately. Freight shipment determined by volumn weight; ship to address; loading dock; inside delivery; etc. Contact us for details. Note: Populas Furniture Workbenches once shipped from the manufacturer are non-refundable/non-returnable - so please call our trained staff with any questions you may have prior to ordering - we will ensure that you get exactly what you need.